Salese™ is a slow dissolving soft dry mouth lozenge that delivers essential oils and other beneficial ingredients to reduce bacterial levels in the mouth and fight the symptoms of dry mouth. 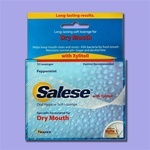 One of the most effective Xylitol lozenges currently available is Salese Lozenges. The Original has a crisp minty taste that delivers a fresh-mouth sensation will last up to several hours. There is now a new Lemon flavor for those sensitive to the mint or would prefer a mild soothing saliva product. Salese™ is a sustained release product that delivers active ingredients efficiently and continuously in small doses. The extended contact increases the oral hygiene benefits and the fresh mouth-feel essential to those suffering from Dry Mouth, and maintains a healthy pH balance and traps the odor causing compounds (VSCs) responsible for bad breath. Salese™ is also easy to use and convenient to carry. The sustained action of Salese™ effectively penetrates the biofilm and kills the bacteria that lie within the biofilm. 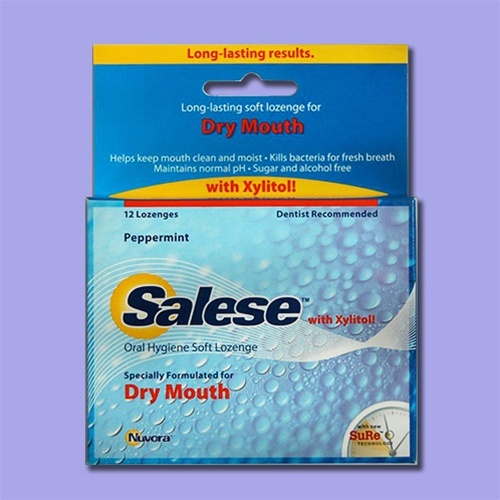 Salese™ lozenges also contains Xylitol which is a potent inhibitor of bacterial growth. The product's unique structural combination of active ingredients built upon an advanced polymer delivery system ensures continuous release of beneficial agents for treating a dry mouth condition and providing a continuous fresh-mouth sensation. Salese™ is not a mint. Many patients have found the length of time for the Salese™ to melt to be as much as 3-4 hours, making it also very economical. Mints do only one thing and that is they attempt to cover up odors. Unlike Salese™, mints do not provide any kind of therapeutic benefit, and because of this we never recommend them.